Our experience and understanding of the laws of nature teach us that the same event never happens many times in a row, and it is by virtue of this acquired knowledge that we dismiss the repetition of "heads" or "tails" many times consecutively. If Google hits are anything to go by, d'Alembert is remembered chiefly today as the author of a codified gambling staking plan. 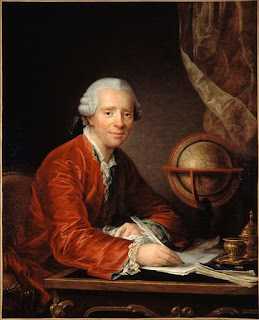 Although there is no documentation, the d'Alembert System probably dates from the late 18th or early 19th century and was not "invented" by d'Alembert at all, though it is loosely based on his speculations on the mathematics of probability. The system is associated particularly with outside bets in Roulette, but applicable to any game of chance based on 50-50 probability. It relies on the idea that prolonged runs of a single outcome are less likely than an even distribution of outcomes. 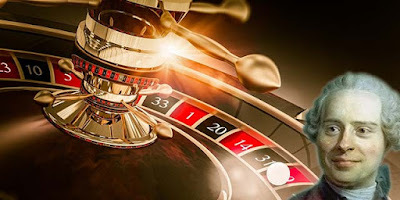 The strategy is simple: the player always bets on the same outcome; if he loses he increases the stake by one chip, if he wins he take away one chip. As the table shows, if he succeeds in returning to his original bet, he will have made one chip for every winning coup. Provided the game lasts long enough to approximate to mathematical probability, the result is will be a modest gain. (The Martingale system is similar but the number of chips are doubled for each loss making the risk much higher). So where does d'Alembert fit in? The betting plan is named for d'Alembert since his work on probability supported the theory that a consecutive run of similar events (for example repeated tosses of the same side of a coin) was inherently unlikely. Perhaps fortunately, d'Alembert himself was not optimistic that mathematicians made effective gamblers. In the Encyclopédie article "Géomètre" he takes issue with Diderot's dismissive comparison of the two: granted, both compute and calculate; but a good gambler operates by instinct and seizes his opportunities without lengthy reflection. If the evidence of experience is anything to go by, great geometers are poor gamblers - a truth which d'Alembert claims to have learned from bitter experience.